You’ve read our Guide for Allies. You’ve bought your button (or sticker, or patch, or…). You probably follow us on Facebook, Twitter or Tumblr. Now you can sign a pledge to declare your support of trans and gender-nonconforming people. I pledge to pay attention to the struggles and triumphs of trans people both in the national news, and in my own community. I pledge to speak up against injustice. I will contact my elected representatives to make sure they know I support equity, justice and fairness for trans people in my country, state, city and neighborhood. I pledge to advocate for the use of trans-inclusive language and practices in my community. I will not wait for a trans person to bring up issues like pronouns and bathroom safety. I am empowered to effect change. I pledge to wear my #illgowithyou gear responsibly. I will avoid verbal and physical violence while wearing my button. I will consider my own safety first in any risky situation. I am a witness, a buffer, and an advocate – in that order. I pledge to speak for myself and my experiences only. I promise to never tell any part of a trans person’s story without their explicit request. Leave a comment below (scroll to the bottom!) to pledge your support publicly. You can also download a printable pledge for events from the Media Kit page. Please note that comments on this site are moderated, so it may take some time for yours to appear. Thank you for understanding. Organizer G, Organizer H, Organizer J and Organizer D all pledge our support to this movement, to trans and gender-nonconforming people, and to the rights of all people to live their lives safely and peaceably. No one should be afraid to live their genuine life. I am an ally, I will go with you and I will support your right to do so. I will go with you. I will stand with you. I will fight with you. I’ll go with you. To make you feel. Like a person. Who is real. In a bathroom. On a train. Even out in the rain. To the doc. In a store. And I’ll do even more. For you I’ll fight. I’ll explain. I’ll try to fix their brain. Those who won’t try to see. That you just need to pee. I am an ally. I am sorry for the pain and hurt cisgender people have caused and I will fight for your equality every day. Everyone should be safe. I pledge to help make that happen. I pledge to support transgender, gender variant, and gender non-forming, people through my actions and deeds. I pledge to speak up and speak out when injustice is perpetrated, and to stand with people of all genders to prevent injustices. I pledge my support for and involvement in this movement. Yes I do pledge to pay attention, advocate for and be an ally to transgender and gender non conforming people ! As long as I am able, I will fight for the rights and safety of the LGBTQ community. I will take the pledge. Thanks for giving us an opportunity to show our support for the LBGT community. I am a straight ally. I am happy to be able to help in any way I can. I will go with any lady, regardless of their biology, to the restroom. If you are at a Florida convention just come find me. I’m almost always at my booth. I pledge my support and assistance to this movement, no one should ever be afraid to be who they want to be. I Alissa Kurth, pledge to always stand up for what’s right and what is EQUAL. I pledge my support to this movement in honor and protection of both the people in my family who struggle for social equality and all people around the world who are affected by gender-based discrimination. I pledge to take this honor to heart and always wear my pin so people know they have support. I pledge my support to this movement and to the rights of all trans and gender-nonconforming people. This is so important, and pathetic that it’s not in our human nature to care for, protect, inspire, encourage and support one another no matter the cause! I’ll be getting and rocking some buttons! This “human dilemma” is exhausting! Because EVERYONE is a person. I pledge! I’ll be ordering my buttons shortly. I pledge to be the change I want to see in the world! I pledge to help anyone be who they were meant to be, in any way I can! of course I’ll go with you. Every person has the right to feel safe. I pledge to support all people! You have support and, if you want, a friend in me. Today, I take the pledge my support to this movement and others who may be in need. I will assist those who need to use the restroom regardless of gender, race, socioeconomic status, religion, mental or physical handicap, or political affiliation. I take this pledge seriously and will act in accordance with all laws to ensure the safety of those around me. If you see me with my #illgowithyou pin, you will be safe no matter who you are. I’ll go with you. And pass you some toilet paper if there is none in your stall. I am the mother of a trans child and I would hope someone would go with him if he felt unsafe. Everyone should have the right to be the individual they were born to be. I support a person’s right to be none other than themselves ! I am an ally. No matter your reason, if you need someone to support you I will be there. I take this pledge to be the right kind of ally for those who need one. I will responsibly uphold this pledge. In Ogden Utah. Anytime. Anyplace. Anyway that I can be an ally, I am there. As a bisexual man who has been out of the closet for thirty three years I can empathize greatly with the struggles of the transgender and gender non-conforming family today. The fight we fought decades ago must be fought and won again, and again, and again. Until we are all simply people, with equal access and opportunity under the law. I’ll go with you. I am for you. You are worth it. I am here for you, no matter your gender, age, or orientation. I vow to be your ally, advocate, and friend. I take the pledge. I will happily help anyone who needs to feel safe in the bathroom and outside of it. I want everybody to be safe and be able to be themselves. Do what you need to do. I got your back. I pledge to go with anyone feeling unsafe in a gendered space, and vow to never allow mistreatment of transgender individuals in my presence. I promise to promote awareness of their struggle, and will continue fighting to end it. I am honored to play any small part in making certain that fellow human beings are treated as such! I pledge my full and unwavering support. Wonderful! My daughter just joined Gay-Straight Alliance at her High School last week! I wanted to do something too! Thanks for doing this! I am a THOUSAND % in and I look forward to seeing real change in our communities. We all deserve the right to live our lives authentically and without fear. I stand with you, I stand up for you, and I’ll go with you. I am already living this pledge but I vow here to do it better! YES! So happy to take this no-brainer pledge. Count me in, friends. I’ll go with you. I’ll always go with you. I pledge to be an ally always and a source of support when needed. I am your ALLY!! I will always Go With You. You are never alone!! I am an ally, and I will go with you. Everyone is equal, everyone is entitled to live their life in safety. Straight cis ally. Was happy to buy multiple buttons and give them to my other ally friends. Love conquers hate. Basic human dignity is everyone’s right. I support every single one of you! I will absolutely go with you! I will stand with my trans fellow wonderful human beings in the fight against hate and ignorance in this bathroom issue and in any other issue the community is faced with! I’m an ally for life! My ex was trans male. As a member of the LGBT community, I’ll stand by you, and stand up for you. I’ll go with you, always. Love my trans friends, family, and clients. We have a responsibility to be vocal advocates to muffle the noise of backward politics. I pledge to advocate for the rights of trans people and to actively support the GLBTIQ community. I am a fierce, determined, lover of all things right, advocate for my young adult Daughter that just so happens to be Transgender. This kid has taught me more about life than I could of ever imagined! Ordered my buttons last week! I pledge to go with you! I support the rights of all humans to be treated as humans without fear of being who they are comfortable being. No one should have to live in fear over something so trivial. I don’t want my future children growing up in a world like this. If politicians want to make this an issue, we have to stand together. They can’t stop all of us. I’ll go with you because no one should be afraid to go pee. My trans adult daughter has taught me a great deal about her situation and that of her friends. I continually learn how to be a helpful ally and pledge to do whatever I can to help and educate others. This should matter to all of us! As long as one group, or even one individual, can be oppressed, any of us can be. People need to be free to be who they are! I pledge to always protect and respect any person who is being persecuted simply for living the way that is true to themselves. I will go with you, always. being who simply needs to use the restroom. Be proud, be strong, be who you were born to be, standing or sitting! You need me..I am there. I wear my pin as a beacon. I am here for my fellow humans. We are all in this together and there is power and safety in numbers. I will always go with you. I will always help my fellow people. Boycott North Carolina and anywhere else that tries to discriminate against transgendered or transitioning individuals! I’ll go with you! Every time, anywhere, no questions asked. I pledge to assist transgenders needing to pee in peace! No human being should be afraid to pee! Just a quick note: transgender is an adjective, not a noun! You want “transgender people”. I pledge to go anywhere I’m needed to help someone feel comfortable in their own skin. I will always support the rights of humans to be human. I promise to be an ally if needed to go into the restroom with a PERSON and help defend them if needed against the bullies. 2 people very dear to me are transgender and I’d be devastated if something happened to them because they didn’t have an ally. If you need a hug, a shoulder to cry on or someone to talk to in the middle of the night, that’s me, so of course I’ll Go With You!. Till this crazy country of ours gets its priorities set straight & even after, I’m here for you! I will stand up for friends and others who are not being treated as equals. We are all HUMANS. As a folk dance teacher, I work in a gendered profession and environment. Although I’ve never yet had a transgender or gender-fluid individual as a student, my students know that it’s not important which part they dance as (lead or follow), and I make sure to point out that it’s traditional for boys to dance lead but that if one of the students wants to dance the following position they can. It’s traditional for girls to dance either part in the Scandinavian dance tradition. I just had an issue with a gender-conforming male student who suddenly decided he wanted to curtsy instead of bow and started acting disparagingly feminine, saying he was transgender without knowing what it really means. I and two other adults had a talk with him and now he knows that it’s not accepted to make fun of someone of another gender identity, even if there is not a person in the group. I pledge to walk along side those in need of support, a hug, someone to listen or sit with. I have been blessed in my life to have had family, friends, strangers, and community gather when I needed support and someone to walk with me along some of lifes travels. You are loved. You are celebrated. I will go with you. I’m a mom, a teacher, an advocate, and an ally. I’ll go with you! I drive the gay/trans bus for many kids to a Friday night group meeting. I think they should be protected every where they go. I pledge to go with you. The bathroom is a place where our bodies find relief and it should not be an upsetting nor dangerous place for any of us of any gender variance. I am enby and I will go with you, too. I am a mother and a fighter, I will fight for you always! I’ll go with you because you have every right to use the restroom without fear or discomfort. I pledge to do my part to protect human rights! Yes I will go with you. I will support I will always support. I love you all. I pledge. I am a ftm transgender, I’ve been out since I was twelve. I’ve had a rough life with my family not accepting me. Now I go out of my way to make sure I am there for anyone in the LGBTQPA community because no one was there for me. I’m trying to start a project for the transgender community but I need help anyone willing to help me out please contact me. On Facebook – Neddy Smith DeSalvo. I’ll take the pledge. Let’s be nice to everyone. We are all different and have different needs. YOU do not know ME or why I look as I do. Stop hating. Let’s respect each other as we are and live and let live. I pleadge to be here when you need help. It’s time to take a stand and we will do this together! I’ll go with you. I think I’ve signed this before, but I’ve given away my buttons to other allies, so I just re-stocked. 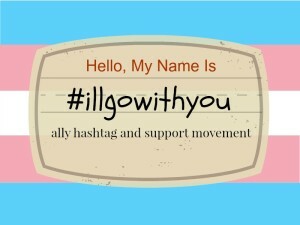 #I’llgowithyou. This is so important! Let’s foster safe spaces for all of our brothers and sisters. I’m nonbinary trans with disphoria and I’ve been having a rough go of it lately and am still learning about myself. I’m not out to my family, only one person who is an on-and-off again friend who still doesn’t understand or use correct pronouns though DOES accept me. Humans are Humans. I’ll go with you. I will go with you! I pledge to fight with you to feel safe! I pledge to be an ally. As one who is a part of the heavy metal community, I just want all of my brothers and sisters in ALL communities that I am ally. You will see my button and I will be there for you even if it’s just to have a beer with you or to give you someone to hang out with so you don’t feel alone. That I can promise you! I am a straight, Christian wife and mother of three. I do not understand everything you feel and I certainly have never experienced the discrimination or fear some people have, but I pledge to learn more and to love ALL fiercely and fully. I believe everyone should be able to be themselves and feel safe. I’llGoWithYou!!! #illgowithyou. In my presence, my space and my shoppe(business)I pledge to do all in my power to offer you a safe environment. Peace and Love, Teresa G .
All human beings should be able to live a life that makes them happy. I will go with you and help you in any way I can. Everyone has the right to pee in peace. The persecution of Trans people is a tragedy that has to stop. It’s 2016, I think we’ve got bigger issues than who is weeing where. I’ll Go With You! All wonderful points, and things I am 1000% behind. I am proud to be an ally. I am engaged in the process of discovering my own gender; however, because I currently have passing privilege, I pledge to be a witness, buffer, and advocate for those who fear violence because of who they are. I am empowered to be a voice for empathy and change! I am an ally, and I will go with you. I pledge to help those who do not feel like they cannot be their true selves. I pledge to protect you and have your back. I’m a Mama and a fighter. Please just ask. I’ll go with you!! Day or night, rain or shine. I pledge to be an ally and advocate, and to always push for equality and security. The work this organization is doing is so wonderful! I will always be an ally and love to see so many wonderful people voicing support! I am proud to provide a safe place for all. Everyone needs a safe space to perform human functions. I’m all for gender-free restrooms, but until there are everywhere, I’ll be a Bathroom Buddy. I got my buttons for free from a friend, and to psss the torch, I’m buying more to donate locally as well as a few on scholarship for the organizer. Thank you for taking this initiative! I’ll go with you, anytime, anywhere, whoever you are. I’ll support you, I’ll help you, love you and protect you. For my children and for the children of others. I am so glad there is a way I can help & I’m grateful to this organization for making this possible. I bought some buttons earlier this year and even had someone notice and thank me for having it on my satchel. With the dark spectre of the next president looming over this community and so many others, I shared with people about this button yesterday. So far, two people have asked me for one. Thank you for being here. You have allies. I am one of them. I pledge to go with whomever needs me, and to always stand in support of human rights and dignity. I pledge to go with you. I pledge to advocate for you. I pledge to fight for you. I will be your ally, and your advocate. I pledge to be a safe and welcoming space.